Column: Extra, extra! Newspaper films to screen in Ontario! My annual film series at the Ontario Library is imminent! The schedule is in Wednesday’s column, as are some Culture Corner and other items. I’m taking a few days off, so this is my last column for a week. Longtime readers of this blog will recall a string of comments a few years back by a fella who gave his name as Hal Linker and referred to his wife as Hadla. There was confusion on my part that he quickly cleared up by saying these weren’t their real names but were taken from a globe-trotting couple with a travel show on SoCal TV in the ’60s and ’70s. I thought you might be interested in some clarification about the real Hal and Halla Linker (correct spelling, pronounced Hadla). I am their son. 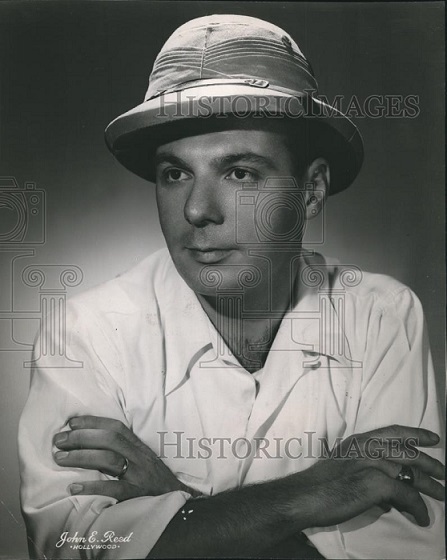 My father did die in 1979, as someone mentioned. My mother is still alive and well. My mother donated the films from our travels to the Smithsonian Human Studies Film Archive, and they periodically release brief clips to YouTube. As you probably know, our TV show was based in LA, but syndicated in over 40 other US cities, and 11 foreign countries. We had a vacation home up at Lake Arrowhead, so often drove through the “Inland Empire” on our way there. I also had a Summer internship at a chemical engineering firm there after my freshman year, but I do no recall exactly where it was. I realize that it is somewhat off topic for your blog, but thought you might be interested in more detail. I was indeed interested and am happy to share this with anyone who remembers the Linkers from TV or is curious about them. This link will explain more about their show and the archive. 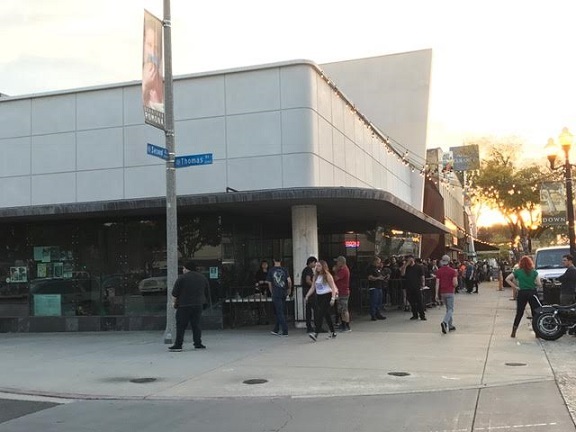 Ontario managed to limit the public relations damage from a plan to cut down dead or diseased trees on Euclid Avenue, unlike Upland. Only one resident spoke at the council meeting last week. I attended and write about the situation in my Sunday column. As usual, many singers and bands performing at Coachella next month will also give concerts in Pomona. I’ve got a list. I’ve also got other items from around the valley, a couple of them about music for the older set. That’s all in Friday’s column. 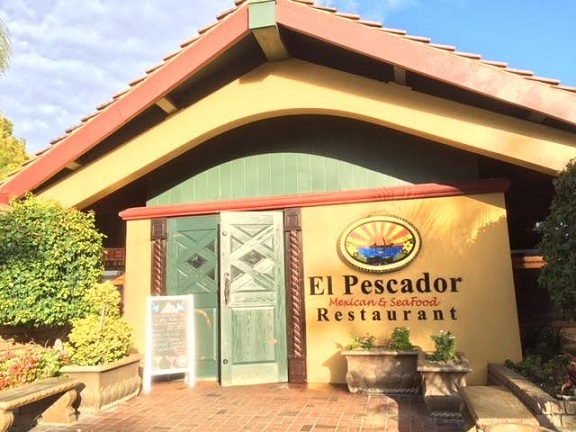 There’s a chain of El Pescador restaurants around L.A., including two in Ontario, one of which is at Mountain and the 60 Freeway. I’ve only been to the one at the edge of downtown, on Euclid at G in a former Bob’s Big Boy. But my two visits a decade or so ago, shortly after it opened, had not been followed up, even though my impression was positive. In fact, when the state librarian was in town a couple of years ago, I directed him there for dinner, and he responded later that he had liked it. 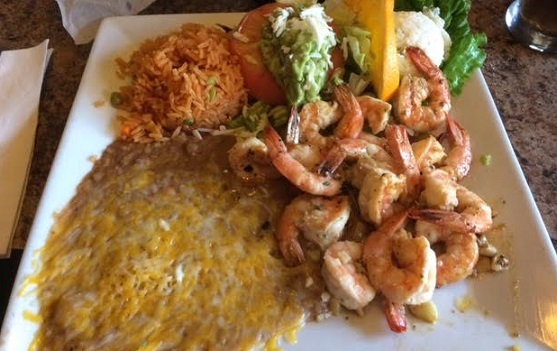 In the neighborhood recently, looking for somewhere to eat, I decided to try El Pescador again. It’s pretty nicely appointed, with a chandelier, Tiffany-style lamps, art, pottery in wall sconces and etched glass on the partitions between booths. 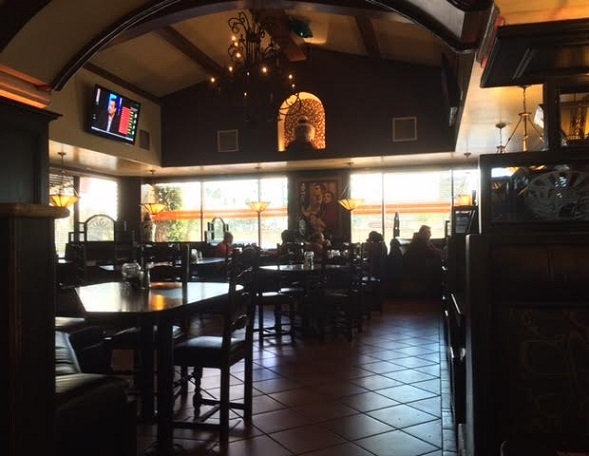 There are probably few Mexican restaurants in Ontario, or the rest of the Inland Valley for that matter, in a setting quite this nice. 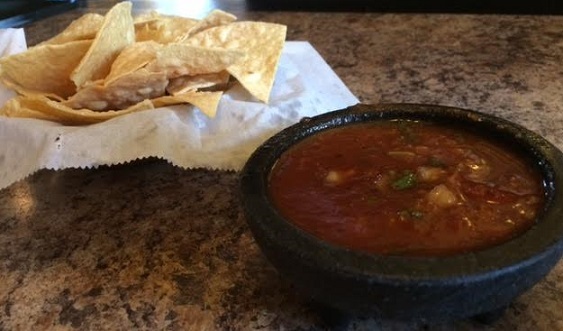 Chips and a bowl of chunky salsa were delivered to my table as I scanned the menu, banda music playing in the background. The menu has a lot of meat and seafood entrees. I went with a standby, camarones al mojo de aja ($17.50), or shrimp in garlic sauce. The platter came with a small green salad, rice with vegetables (ugh, peas), beans with cheese, 13 shrimp, six tortillas and an orange slice. I can’t find anything wrong with the portion, but the food struck me as very average. 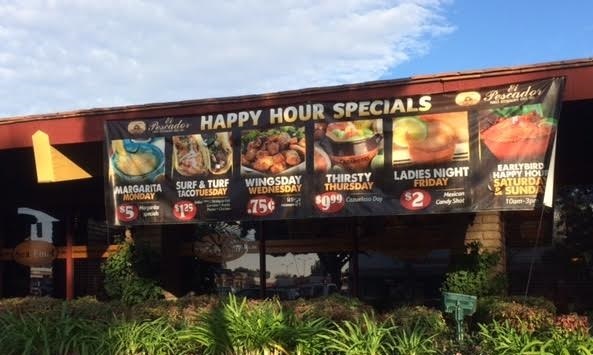 El Pescador was better in my memory, or maybe my tastes have changed. Still, this was only one meal, and you could do worse when downtown. And they make margaritas and have happy hour specials, so there’s that. 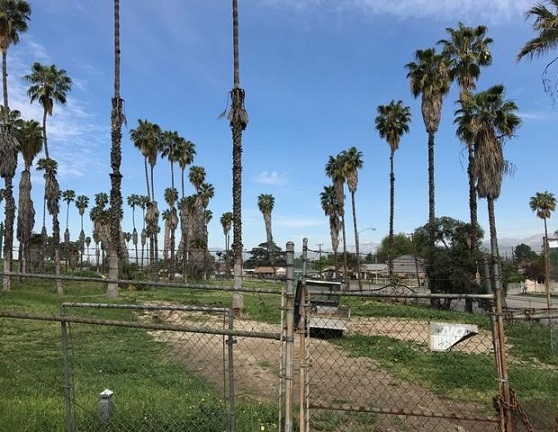 Palm Lake Golf Course in Pomona, established in 1960, is closed at least temporarily after the operator couldn’t make enough money to pay his bills. The city hopes to find a new operator. I explain the situation and the history in Wednesday’s column. Above, a dispiriting view of the course from the south. Two thematically related items from the Claremont Courier’s police blotter, compiled by Matthew Bramlett, got my attention. On March 3, a thief broke into a dental office and made off with about $6 in cash and “an unknown amount of plastic desk drawer organizers” before the alarm went off and he fled. It seems that on the mean streets of the City of Trees and Ph.D.s, burglars want to stay organized and moisturized. 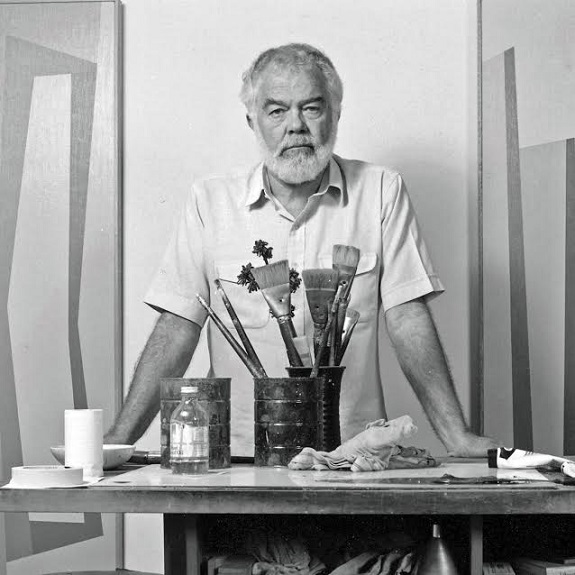 Karl Benjamin, 1987. Photo by Gary Colby. In a nifty fund-raising idea, brushes from local artists past and present will be auctioned or sold to benefit the Claremont Museum of Art. 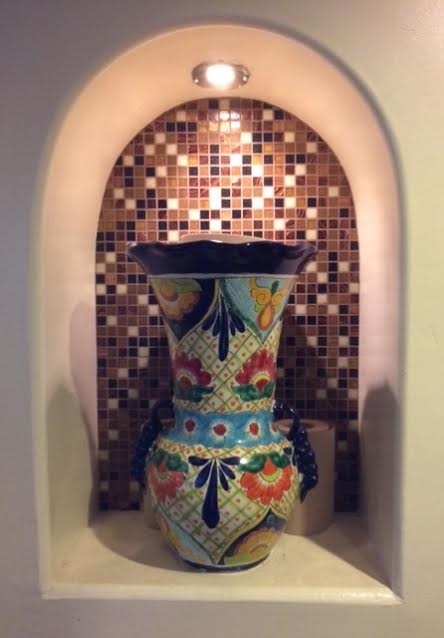 That item leads off Sunday’s column, followed by response to my recent column on my internet provider, Culture Corner items and a Valley Vignette. 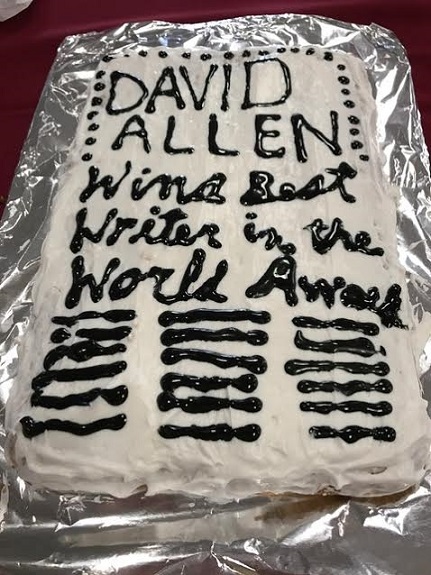 A speaking engagement on my birthday was accepted with misgivings, but the University Club treated me right: with a treat, namely, a cake. That kicks off Friday’s column. Under an equal-time statute, an item is given to the Claremont Pie Festival. Then there’s a Culture Corner and a Valley Vignette about an Upland figure. 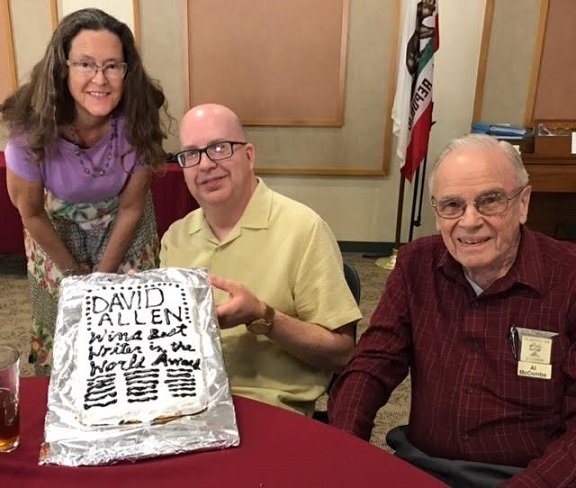 Above, club member Anne Sonner, who baked the cake, poses with me after Al McCombs of the Chino Champion, another club member, found the cake’s headline free of typographical errors, if perhaps not free of hyperbole. Below, details of the award remain maddeningly vague. 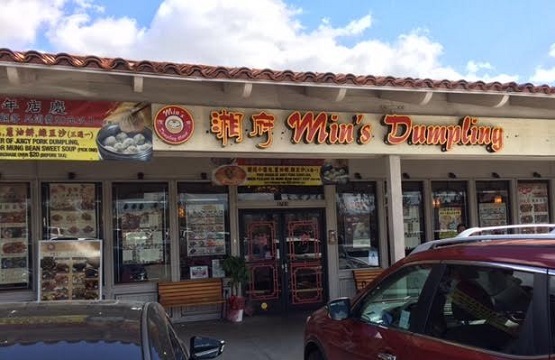 There are Min’s Dumpling House locations in Chino, Corona and Rancho Cucamonga, the latter of which I tried out recently at lunchtime with two librarian friends. 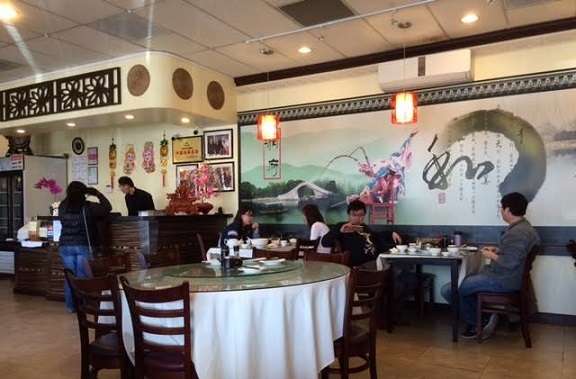 It’s in the 99 Ranch center, home to another Chinese restaurant, a Korean restaurant and a boba shop. Min’s is on the small side, but brightened by sunlight, art, carved screens and other decor, and the seating is spaced apart, giving everyone some elbow room. Its menu is on the large side, with 156 items: rice dishes, dim sum, soups, seafood, hot pot and more, including 15 vegetable-only dishes. The specialty is cuisine from the Hunan province. Many dishes are spicy, but they’re marked as such on the menu and we stayed away. 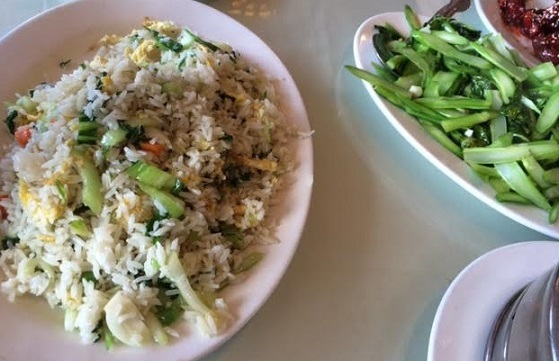 We ordered six items: pork dumplings (item 1, $7); BBQ pork buns (item 5, $6); shrimp and pork dumplings (item 19, $9); sweet and pungent spare ribs (item 59, $11); Chinese broccoli with garlic sauce (item 123, $8); and vegetable fried rice (item 150, $7). 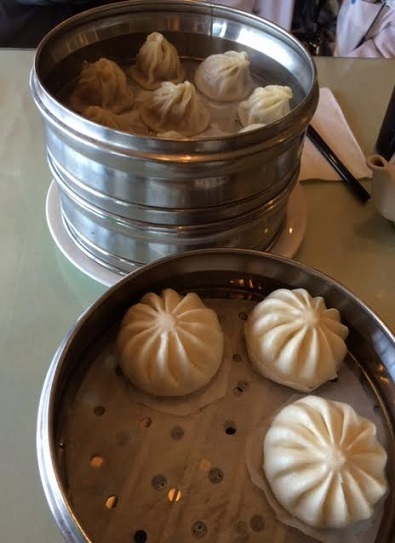 I was a big fan of the dumplings — the pork were soup dumplings, the shrimp and pork were simply filled — and the pork buns. Nothing wrong with the broccoli either. The others liked the spare ribs and rice the best. 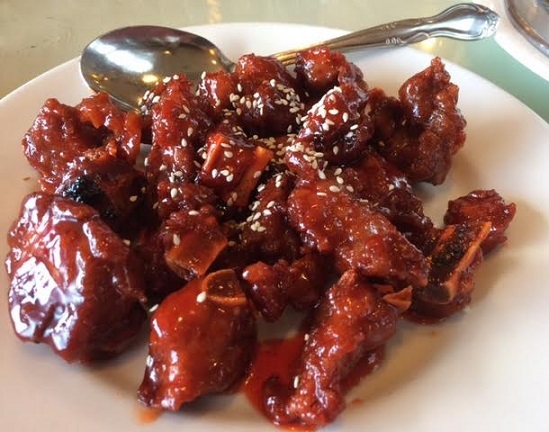 Min’s is among Rancho Cucamonga’s best Chinese restaurants, and given that the menu has a couple of my favorite items, cumin lamb and beef roll, I’m sure I’ll be back.